Let’s face it; we all need to get rid of rubbish at some stage in our lives. Some seem to generate too much waste material. But instead of letting your rubbish take over your property and, in the worst case scenario attract vermin and bad smells, there is a simple solution to all your rubbish removal needs. Handiskips SA have a lot going for them. Gone are the days when rubbish was simply dumped in a tip. Today the environment is a top priority and that’s where you can take confidence in dealing with Handiskips. They proudly boast of recycling up to 95% of the waste they collect – your rubbish. It makes you feel good knowing your waste is not being dumped but being recycled. A skip from HandiSkips has a huge benefit. It has a gate or door which is easily opened allowing you easy access to the skip itself. None of this lifting heavy waste up and over the skip wall. Here you wheel or carry your waste into the base of the skip. Too easy. You don’t want a massive skip if you only have a small amount of waste. You have the option of choosing from several sizes of skip. All come with an easy access door. This where the cost factor is so important. You can save money depending on the size of skip and you can move a great deal of waste because the biggest skips allow you to do just that. 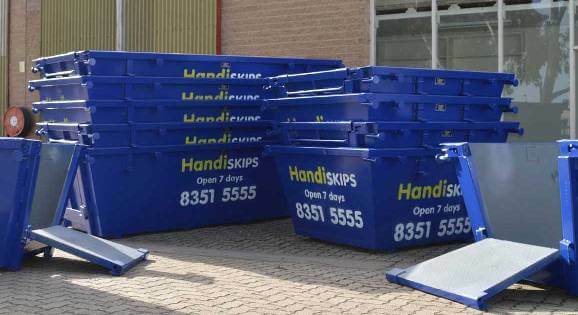 A simple check on the service you get from HandiSkips will quickly show you how you are quids in when you choose one of their skips. Being a family owned and operated company is a plus. You deal with the owners. Being open seven days a week means you can arrange for delivery and pick-up at a time that suits you. Knowing all the tech details helps you make the right choice. Knowing the difference between green waste, general waste and quarry waste helps you make the right decisions. There are some things like asbestos and paint which are banned and again, all that relevant information is there on the web site. You can call Lisa on 8351 5555 and ask whatever you need to know about removing your waste. Rest assured you’ll receive expert service and there are glowing testimonials from so many of their happy customers.